Michael Glancy was born in Detroit, Michigan in 1950. He began working with glass in 1970 as a student. Glancy received a BFA from the University of Denver in 1973 and a second BFA in sculpture from the Rhode Island School of Design in 1977. He earned an MFA in glass from the Rhode Island School of Design in 1980, where he studied with Dale Chihuly. Glancy is a member of the adjunct faculty in the Jewelry & Metalsmithing Dept. at the Rhode Island School of Design. 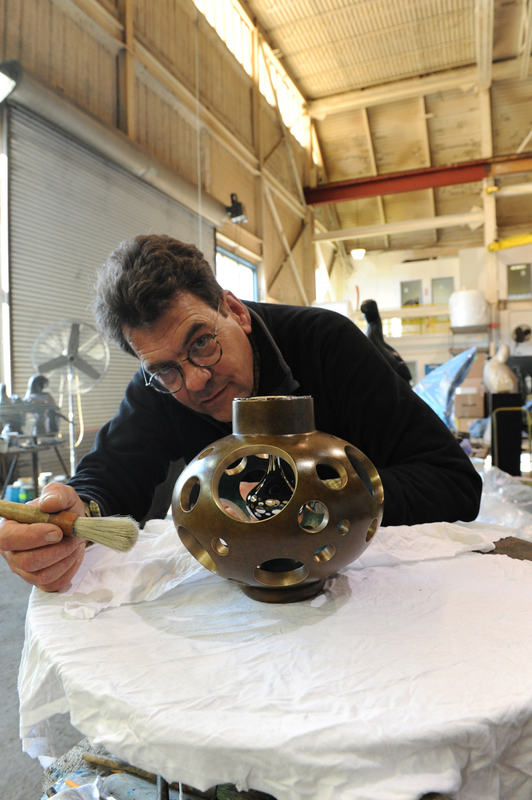 He has also been an invited faculty member at the Pilchuck Glass School in Stanwood, WA. Glancy’s career has included numerous solo and group exhibitions, most recently in private galleries in New York City and Basel Switzerland. His work has been acquired by major museums and public collections, across the USA and worldwide. The Metropolitan Museum of Art in New York City acquired their first Michael Glancy object in 1980 from the inaugural exhibition of Heller Gallery on Madison Ave. Curators returned 27 years later to acquire a major work for the 2007 exhibition ONE of a KIND: The Studio Movement. Glancy lives in Rehoboth, Massachusetts with his wife Robin, and has two adult sons. Glancy is also an avid gardner, sailor, and races a wooden Beetle Cat sailboat out of the Edgewood Yacht Club in Edgewood, RI. SELECTED EXHIBITIONS- SOLO 1979 Gallery One, Western Maryland University, Westminster, MD 1980 The Heller Gallery, New York 1981 Habatat Galleries, Detroit Heller Gallery, New York 1982 Heller Gallery, New York 1983 The Glass Gallery, Bethesda, MD Habatat Galleries, Detroit 1984 The Heller Gallery, New York The David Bernstein Gallery, Boston 1985 Habatat Galleries, Miami Habatat Galleries, Detroit 1986 The Heller Gallery, New York 1988 Habatat Galleries, Detroit Habatat Galleries, Miami 1989 Heller Gallery, New York 1990 Commission: “Golden Nucleic Fusion,” 61″h x 101″w x 40″d, S.L. Green – Lobby, 333 East 38th Street, NYC Fellowship Grant: Centre International d’Art Contemporain, Château Beychevelle, Bordeaux & Paris 1991Habatat Gallery, Boca Raton Galerie von Bartha, Basel, Switzerland 1992 Heller Gallery, New York 1993 Habatat Gallery, Boca Raton 1994 Galerie Von Bartha, Basel, Switzerland Fermi National Accelerator Laboratory, Wilson Hall Gallery “Michael Glancy – Sculpture: 1970–1994,” Lecture, (brochure; illustrated). 1995 Galerie von Bartha, Basel, Switzerland, November. 1997 Barry Friedman Ltd., New York, SOFA, Chicago, Habatat Galleries, Florida, solo presentation. 2000 Barry Friedman Ltd., New York, “Infinite Obsessions – The Art of Maurice Marinot (1921-1934) and Michael Glancy (1998-1999); November, 1999 – January, 2000. 2001 University of Michigan-Dearborn, Berkowitz Gallery, “Michael Glancy – mid career survey, 50 works: 1970-2000” Galerie von Bartha, Basel, Switzerland , May. 2004 Barry Friedman Ltd., “The Harmonic Chord,” New York, May. 2006 Barry Friedman Ltd., “Periotic Equilibrium,” New York, November. 2011 Barry Friedman Ltd., “Infinite Obsessions,” New York, May. 2013 SOFA Chicago, “Infinite Obsessions,” presented by Barry Friedman Ltd., Chicago, October. SELECTED EXHIBITIONS – GROUP 1980 Seraph Gallery, Washington, D.C., “6”. Museum of Art, Rhode Island School of Design, Providence, “M.F.A. Show.” The David Bernstein Gallery, Boston, “Contained.” 1980-83 The Corning Museum of Glass, Corning, “New Glass Review 1, 2, 3” (catalogue). 1980-89 Habatat Gallery, Detroit, “8th – 17th International Invitational.” 1981 DeCordova Museum, Lincoln, MA, “Glass Routes” (catalogue). American Craft Museum, New York. 1982 Hokkaido Museum of Modern Art, Sapporo, Japan, “World Glass Now “82” traveled to Daimaru Gallery in Tokyo and Otani Memorial Art Museum in Nishinomiya (catalogue). Huntington Galleries, Huntington, West Virginia, “New American Glass: Focus West Virginia” (catalogue). Morris Museum of Art and Sciences, Morristown, New Jersey, “American Glass Art: Evolution and Revolution” (catalogue). The Art Gallery of Western Australia, Perth, “International Directions in Glass Art” (catalogue), traveled throughout Australia. 1983-85 United States Embassy, Prague, Czechoslovakia, “Contemporary American Glass Sculpture” (catalogue). 1983 American Craft Museum II, New York, “Pattern” (catalogue). SM-Gallery, Frankfort, Germany, “Koln-Kunst & Antiquitatenmasse.” Tucson Museum of Art, Tucson, “Sculptural Glass” (catalogue), traveled to Owens-Illinois Art Center, Toledo and The Fine Arts Center, Tempe, Arizona. 1984 The Leigh Yawkey Woodson Art Museum, Wausau, Wisconsin, “Americans in Glass” (catalogue), traveled extensively through Europe in ’84 and ’85. The Arango Design Foundation, Miami, “Glass” (catalogue). Image South Gallery, Atlanta, “14 Artists: Glass” (catalogue). 1984/86-89 Yamaha Corporation, Hamamatsu, Japan, “Glass Now ’84” (catalogues), traveled extensively through Japan. 1985 Hokkaido Museum of Modern Art, Sapporo, Japan, “World Glass Now ’85” (catalogue), traveled to Tokyo, Shimonoseki, Gifu, and Osaka (86). Ella Sharp Museum and Habatat Galleries, Michigan, “Glass: State of the Art” (catalogue), Traveling exhibition. Musée des Beaux-Arts, Rouen, France, “American Glass Artists” (catalogue). 1986 The Oakland Museum, Oakland, “Contemporary American and European Glass from the Saxe Collection” (catalogue). 1986 Huntington Galleries, Huntington, West Virginia, “New American Glass Focus 2 West Virginia” (catalogue). The Newport Art Museum, Newport, “Today’s Artisans.” 1987 Sotheby’s New York, “The Object as Art-G.M.H.C. Benefit Auction” (catalogue). Center International de Recherche sur le Verre, Marseille, France, “Cahiers du CIRVA” (catalogue). Hunter Museum of Art, Chattanooga, “Group Show.” Detroit Institute of Art, Detroit, “From the Permanent Collection.” Hessisches Landsmuseum, Darmstadt, Germany, “Bildwerk in Glas” (catalogue). 1988 Hokkaido Museum of Modern Art, Sapporo Japan, “World Glass Now ’88” (catalogue), traveled to Shimonoseki, Tokyo, Gifu, and Osaka. Florida State University Gallery;, Tallahassee, “A Generation in Glass Sculpture” (catalogue). Habatat Galleries, Detroit, “New Art Forms: Navy Pier, Chicago.” 1989 Christie’s, New York, “Contemporary Ceramics and Glass” (catalogue). Christie’s, New York, “Masterworks of Contemporary Glass – New York Experimental Glass Workshop Benefit Auction” (catalogue). “The Spectacle of Chaos,” Chaos Foundation, Chicago (catalogue). 1992–94 “Glass:1962–1992,” The Morris Museum, national tour, (catalog, illustrated). 1993 “Clearly Art-Pilchuck’s Glass Legacy,” national tour, (catalog, illustrated). “CIRVA–le verre, Manieres de Faire,” Musee du Palis du Luxembourg, French Ministry of Culture, Paris (catalog, illustrated). “The Rhode Island Connection–Glass Masters,”Newport Art Museum, Newport, Rhode Island (catalog illustrated). 1993 Hokkaido Museum of Modern Art, Sapporo, Japan, “World Glass Now ‘94” (catalog illustrated), traveling to Shiminoseki, Tokyo, Gifu, and Osaka. CIRVA–le verre, Manieres de Faire,” Seoul Art Center, Seoul, Korea: April, May, June 1994. Meguro Museum of Art, Tokyo, Japan: Oct, Nov, Dec. 1994 Ashoya Museum, Ashiya City, Hyogo Prefecture, Japan: April, May 1995 “Vänersborg Glass Show,” Vänersborg, Sweden: May–September 1994 Workshop & Lecture, May 10–15, 1994. 1995 “Contemporary Crafts & the Saxe Collection,” Renwick Gallery of the National Museum of American Art—Smithsoniam Institution, Washington, D.C., Lecture: Renwick Grand Salon, January 22, 1995 “A Museum in the Making: The Gerard Cafesjian Collection,” Scottsdale Center for the Arts, Scottsdale, Arizona 1996 “Studio Glass in The Metropolitan Museum of Art,” The Metropolitan Museum of Art, New York, New York Basel Art Fair, Galerie von Bartha, Basel, Switzerland: June, 1996 “Glass Art – The Belkin Collection,” Huntington Museum of Art, Huntington, West Virginia: July-October, 1996 TEFAF, Galerie von Bartha, Basel, Switzerland: October, 1996 Invited Artist, “Venezia Aperto Vetro,” Palazzo Ducale, Venice, Italy: September-November, 1996 1997 “Masters of Contemporary Glass: Selections from the Glick Collection,” Indianapolis Museum of Art, Indianapolis, Indiana, September-November, 1997. “1997 Pilchuck Glass Exhibit,” Port of Seattle, Sea-Tac International Airport. The European Fine Art Federation (TEFAF) Exhibition, Basel, Switzerland, Galerie von Bartha: October. TEFAF, Galerie von Bartha, Basel, Switzerland: November, 1997 “Glass Today,”The Cleveland Museum of Art, Cleveland, Ohio, June 22-Sept.14,1997 : 120 pg. illustrated catalogue. “Glass Today by American Studio Artists,” Museum of Fine Arts, Boston, Aug. 13, 1997-January 11, 1998: illustrated catalogue, pgs. 30-31. 1998 “Luminous Form-an Invitational Glass Exhibition,” The Providence Art Club, Providence, RI, January 11-23:New England/Boston “Art Now-Gallery Guide,” cover story, illustrated, pg.5. “Corning Museum New Glass Review,” Corning Museum of Glass, Corning, NY SOFA, NYC, April, Barry Friedman Ltd. SOFA, Chicago, October, Barry Friedman, Ltd. “American Glass: Masters fo the Art,” Smithsonian Institution Traveling Exhibition Service, national tour, 1998-2000, exhibition catalogue by Lloyd Herman, 65pgs. illustrated, pgs.19-22. “A Passion for Glass,” The Aviva and Jack A. Robinson Studio Glass Collection, Detroit institute of Arts. “Glass”, Los Angeles County Museum of Art, Sherwood Gallery, Anderson Building of Contemporary Art, LA, CA TEFAF, Maastricht, The Netherlands, Galerie von Bartha, March. TEFAF, Basel, Galerie von Bartha: November. 1999 “Clearly Inspired – Contemporary Glass and Its Origins,” Tampa Museum of Art, 28 March – 6 June, 1999 + Fort Wayne Museum of Art, 11 September – 9 November, 1999, exhibition catalogue, Karen Chambers, illu.,pgs.61-64. “Faculty Biennial Exhibition,” Museum of Art, Rhode Island School of Design, Providence, 1 Oct. 1999- 2 Jan. 2000. “CULTURA” Art and Antiques Fair, Basel, Switzerland, 13 – 21 November, 1999, Galerie von Bartha, illustrated. 1999 TEFAF, Maastricht, The Netherlands, Galerie von Bartha, March. 2000 CULTURA, Art and Antiques Fair, Basel, Switzerland, Galerie von Bartha, illustrated. Contemporary Glass Sculpture, Musee de Design et d’Arts Appliques /Contemporains, Lausanne, Switzerland. Masterworks: 1900-2000, Christie’s New York, June, 2000. TEFAF, Maastricht, The Netherlands, Galerie von Bartha, March, illustrated. Taking Form in Glass – Contemporary Works from the Palley Collection, Lowe Art Museum, University of Miami 2001 Centennial Exhibition, Providence Art Club, Providence, Rhode Island, October, illustrated. 2002 Contemporary Directions, Carnegie Museum of Art & Toledo Museum of Art, 4-8/2002 & 11/2003-2/2004. Selected Exhibitions – Group – continued… 2002 Basel Art Fair, Galerie von Bartha, Basel, Switzerland, “Aventurine Cascade, 2002”, June. UrdanGlass @ 25, Steuben on Madison Avenue, NYC, November – January, 2003. Art of the 20th Century, Barry Friedman, The Park Avenue Armory, November. CULTURA, Art and Antiques Fair, Basel, Switzerland, Galerie von Bartha, October. Art Basel Miami Beach, Galerie von Bartha, Miami, December. Christie’s New York, Important 20th Century Decorative Arts and Tiffany: Innovations in American Design, Lot 131,Dec.10. 2003 Art Palm Beach, Barry Friedman, Palm Beach, Florida, January. Fire and Form, at the Norton Museum of Art, West Palm Beach, FLorida,January 25-March 23, illustrated. Faculty Biennial Exhibition, Rhode Island School of Design, Providence, Rhode Island Jan Erik Ritzman: Exploring the Swedish Tradition, Savannah College of Art and Design, Savannah, Georgia, illus. 2004 SOFA New York, Barry Friedman, The Park Avenue Armory, June. Banner on Park Avenue & catalogue cover. Ministère de la Culture et de la Communication, “Culture Design,” Palas de la porte Dorée, Paris 2006 Gass-Material Matters, Los Angeles County Museum of Art, April-December, 2006, illustrated. Emergence:Early American Studio Glass & Its Influences 1964-1989, Barry Friedman, Ltd., June-July, NYC 2007 One of a kind: The Studio Movement, Metropolitan Museum of Art, New York, NY, 12/22/2006 – 9/3/2007. 2008 Studio Glass in Rhode Island–The Chihuly Years, Museum of Art Rhode Island School of Design, 09, 2008-1, 2009, illus. 2013 Top 10 at 10: Favorites from RAM’s Collection, Racine Art Museum, Racine, Wisconsin Salon: Art + Design, Park Avenue Armory, New York, NY, Bf, ltd., November 14-18.